Frae tap, left tae richt: Ascention Cathedral o Bacău, Public leebrar (Auld Ceety Haw), St. Nicholas Cathedral, Cancikov pairk, Oituz Heroes monument, Ceety Prefectur. xBacău metropolitan aurie is a proponed project. 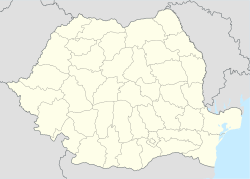 Bacău (Romanie pronunciation: [baˈkəw] ( listen); German: Barchau, Hungarian: Bákó) is the main ceety in Bacău Coonty, Romanie. This page wis last eeditit on 11 Mey 2017, at 23:36.